Here is a review of the station masters at Wolverton in the 19th century. The photograph above is an illustration of how they may have dressed. The new station at Wolverton opened on September 17th 1838 and the London and Birmingham Railway company installed a very young man called Alfred Denny Blott as the Clerk in Charge. They were boot called Station Masters until a decade or so after the railway was founded, so the job from the outset was conceived as one requiring clerical skills, writing out tickets and collecting money. Young Blott (for he was only 21) must have impressed his superiors at Birmingham, where he had worked for a few months. At the time he was single and found lodgings at Old Wolverton. 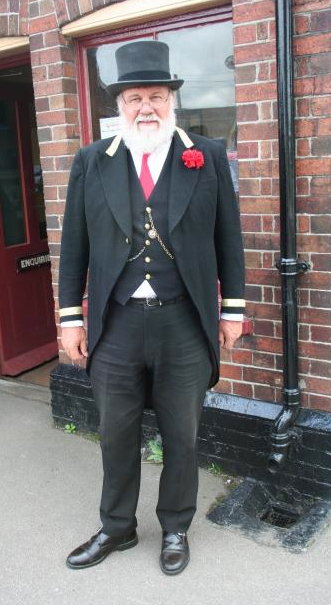 In those early days the railway policemen were given the responsibility for the control and flow of traffic, but it became apparent that each station operation needed to be under the control of one man and the position of station master emerged. Alfred Blott was given some handsome salary increases while he was at Wolverton, earning at his peak £200 per annum. This put him firmly amongst Wolverton’s top earners, alongside the vicar and other senior works staff. I have told the tale of Alfred Blott’s dalliance with an unnamed young lady, which resulted in his transfer to Oxford on October 1st 1851 here, so I won’t repeat myself. He was immediately succeeded by Samuel shakespeare, who was moved from Stamford. he was there for almost three years until July 1854, when he was dismissed. At the moment I haven’t been able to find out the reasons for the dismissal. The salary register simply records that he was dismissed. On July 10th of that year they transferred Thomas Davies from Euston. He was paid £140 a year, £60 less than Alfred Blott, and as the century goes on that £200 salary begins to look extravagant. It is not clear when Davies left but by 1861 Joseph Parker was installed. Parker served until his retirement on 4th October 1877. He moved to a house on the Stratford Road where he lived until his death. J Day replaced him from Willesden. he lasted two years before he was discharged on 24th July 1879. No explanation is given in the salary register. Day, who was born in 1838, was the first Station Master to be born in the railway age. The second was Edwin Bliss, born at Aspley Guise in 1845. He served in the position until his quite early death at the age of 45. By the 31st January 1890 he was too sick to continue and he died on 16th february of that year. In March they brought in Robert Dunleavy, who had been Station Master at Buckingham for ten years. He was 38 years old. As an interesting side note they start to record the height of these men in the salary registers from 1879. Bliss was 5’9″, Dunleavy 6′. Two of his successors were 5’7 3/4″ and Thomas Brinnard was 5″11″. They were all men of above average height for the times. Dunleavy was there for five years and then promoted to eight on Buzzard. The Wolverton salary was now fixed at £140 and reflects the decline of Wolverton from one of the principal stations in 1838 to a stop on the line. Leighton Buzzard, with its branch to Dunstable and Luton was a far busier station. He was succeeded by G T Cable, then about 55 years old. He came from Leighton and it appears to have been a job-swap. Cable looking for a lighter load and the younger Dunleavy wanting bigger opportunities. Cable was probably in poor health at this time as he signed off sick in November 1896 and retired in January 1897. J. Scott was brought in from Cheddington and served at Wolverton until he moved to Rugby on 30th April 1898. Thomas Brinnard became the Station Master to see out the century. he arrived in Wolverton to take up his duties on 30th December 1898 and stayed until he retired on 31st August 1910. The salary register notes that he died on 9th September 1921. He was succeeded by Henry Brinklow.